We had moved to Windsor Locks, CT into a small complex of approximately 50 to 60 families. The units were a combination of single houses and duplexes with a single road running through the units. It was like one huge Mother Goose family with her many goslings. Everyone got to know one another and “neighbors helped neighbors” through good times and bad. The complex paralled Elm Street and was easily accessible to stores, churches and schools. It was a great place to raise youngsters. In addition, at the back end of the complex, there was an undeveloped piece of land which still harbored its own community of small furry creatures. In springtime, the field came alive with beautiful wild flowers. Small bunches of blossoms were picked by small hands and brought home to sit in small vases on peoples’ dinner tables. During the summer, the whole town converged on the land to celebrate the yearly Strawberry Festival. This was a time to watch kids’ races, enjoy hot dogs, hamburgers, soda and just share conversations of town happenings. When fall arrived, the grasses browned and finally laid to rest. Then the winter snows arrived. Boot tracks made trails and children’s bodies, clad in warm coats, were flung backwards with abandonment making “angels in the snow”. These were times when it was safe to go outside at night and after the children were in bed, I would often go out and just stand in the expanse of the field to look up in search of the constellations in the sky. Frequently, I would also take our two children, Mike and Robyn along and we would walk together so they also could enjoy the peace and quiet that had descended on the land. They would play a game of who could first find The Big Dipper among the stars. One particular winter, a “Northeaster” struck the area with a vengeance. The main road (Elm Street) was nearly closed. The plows struggled against the storm trying to keep access for people living on the street and for others like ourselves whose driveway led off that road. Our cars took on the appearance of white hills and valleys. The following morning, since the Town plows still could not get into our street, men emerged from the warm houses armed with shovels. Forming lines, they started at one end of the complex clearing the street yet stopping on the way to help one another extricate their cars. We were at the far end of the street and I decided to go out and see if my dear-older-summer-loving Peugeot would start. It was a warm weather car, so to speak; However, I brushed off the hood, took a hot water bottle and a blanket and laid it on the block of the engine, and went back inside a warm and cozy kitchen. When I returned, to the surprise of everyone (and the chagrin of many who owned newer cars,) my dear car roared alive with a shutter, shaking the snow on its roof. That event caused many laughs for many days but the greatest adventure was yet to come. The winter nights, with their crisp cold that nipped your finger tips, even through wool gloves and bit at your nose, kept us inside more. But one night, just a few days before Christmas, I bundled up the two children for an adventure in a night walk and turning off the flashlight just for the excitement of walking in the dark. The street lights on Elm Street were evident just leaving shadows on our street so that you could look up at the sky and see the grandeur of a winter night. There wasn’t cloud in the sky. The stars seemed to twinkle with a brilliance of awe only possible in the winter. The moon’s rays made diamonds on the snow. As we started out the door, I realized I had forgotten my gloves. I told the children just to stand outside and wait for me. Before I could even find my gloves, a shriek from our son found me racing out to see what was wrong. The conversation ran like this. “MA, MA”, he hollered. “UP THERE, pointing frantically up at the sky with gloved fingers. I looked up and all I was seeing were stars. I searched around and just couldn’t seem to see anything different. “Mike, what is it you see? I asked. “Over there, over there, across the moon”, he cried. “Don’t you see it? It’s Santa Claus and his sleigh. Right there”. Turning my head in a complete circle with my cold feet following, just knowing that there must be a bunch of stray clouds floating around, I realized for certain there were NO clouds in sight. I carefully peered out again from under my hooded jacket and THERE IT WAS! Something was passing over the moon. I squinted my eyes and the image passed into the darkness but you could still see some imperceptible image. Mike continued his personal diatribe insisting that he saw Santa Claus. At home, he explained the whole episode in detail to his Dad. Standing quietly behind this determined child, I caught my husband’s eye and slowly nodded my head up and down for; in all honesty, I had to agree with him. 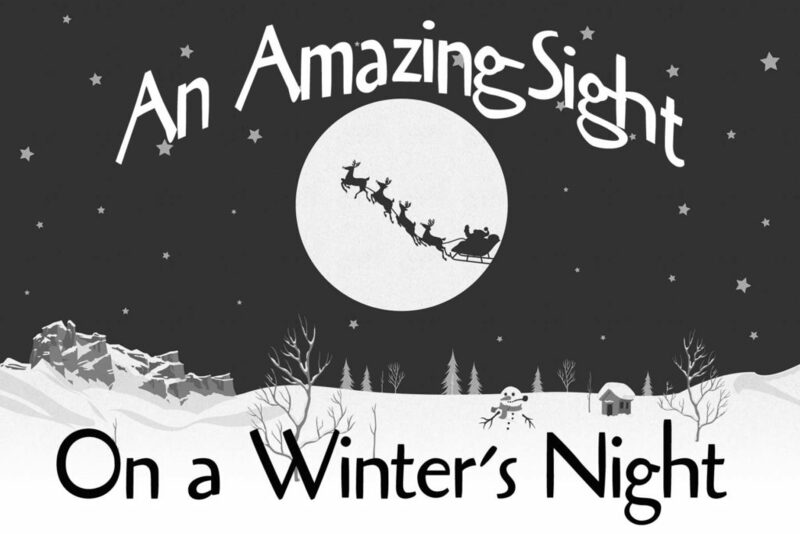 That one cold winter night, just close to Christmas, I saw something pass across the moon’s image. And it wasn’t a cloud. “Well, I still believe it was really him”, he said with a smile. What could I say for I was there. So some cold winter night, shortly before Christmas, when the sky is clear, the stars are twinkling and the moon is out, take a walk, look up at the sky. Perhaps you’ll see what he saw that night. Miracles can happen.